If you’re on the hunt for a great vehicle for your busy family, Rusty Wallace Toyota is here to help! Our family friendly Toyota vehicles are safe, reliable, and stylish – and they’re ready for a test drive today. Visit our dealership in Morristown, just a short drive away from Knoxville and Sevierville. When testing out family friendly Toyota vehicles at the dealership, what factors should you keep in mind? Find a car that fits not just the family that you have, but the family that you’ll have in the future. A Toyota Camry can seat 5, while a Toyota Sienna can seat up to 8. Make a list of your wants and needs. Do you want an efficient hybrid model to drive junior around town, or would you prefer an AWD SUV for weekend trips to the park? Finally, take a look at the NHTSA and IIHS ratings to see how your favorite models stack up. Check out models with Toyota Safety Sense for extra peace of mind! 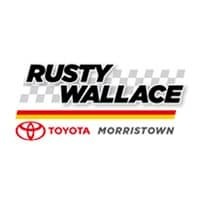 Take the next steps and visit Rusty Wallace Toyota today. We’ll help you sort through our family friendly Toyota vehicles to find the right match for you!